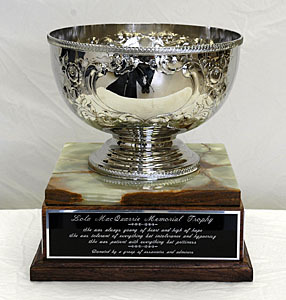 The Lola MacQuarrie Memorial Trophy was donated to the Winnipeg Music Festival in 1968 by a group of associates and admirers. This trophy was originally awarded in an annual competition of winners in School Choir Folk Song Choruses. Today it is awarded for the most outstanding performance of a Folk Song by a School Chorus, Kindergarten to Grade 6. Lola MacQuarrie was born in 1910 and died in 1966. She was active in music circles, first as a competitor in musical events and then as a teacher, adjudicator and broadcaster. Mrs. MacQuarrie contributed to the musical life of her city and her province as director of music for Winnipeg schools, as an adjudicator in musical festivals across Canada and as a guiding hand behind school broadcasts.